A Really Good IdeaThinking of some renovation project for your home? Do you want to add some room? Why not renovate your basement bathroom? It would be fun and exciting to renovate your bathroom. And these are just some of the reasons why: Adding economic value to your household may be an additional expense on your part, but in the long run, you will receive more financial gains when you renovate your basement bathroom. It will look more attractive to prospective buyers or investors once they look at the house and the newly renovated basement bathroom. Adding aesthetic and more practical value to your house. Most often than not, your basement is used as an extra room, an extended part of your living room, your kids’ or teens’ own space, your husband and his buddies beer area, or your own creative room. At most times your home basement is the most used room in your house. Renovating your basement bathroom will then ensure that you, your family and your guests will get to enjoy the basement all the more. You can always imagine, browse through magazines and even look around some showroom homes and find the most suited new design for your basement bathroom. Once you have made your choice, make sure you detail it quite clearly to your contractor so the design that you want will be fully achieved. Indeed, having a bathroom renovation or installing a new basement bathroom can give you a lot of pleasure than what you have thought about. Come to think of it, there are only two things that may happen to basement bathroom – it can be either be considered as the most neglected part of the house because it is not regularly frequented by anyone or it can be the busiest part of the house, because of the number of times you and your family stay in the basement which of course will involve staying or using the basement bathroom too. Because of this, you will really need to make sure that your planning for your basement bathroom should be as effective and efficient you can be. To ensure that you are making the right decision regarding your basement bathroom renovation, you should take note of some interconnected aspects of homebuilding and/or renovation. First of which is the size of your bathroom. If it is a new bathroom that you are going to install, you have to make sure that the size will be proportional to your basement and to your house in general. The size of your desired new basement bathroom will also be the deciding factor of what stuff you are going to put in it – a shower unit, a vanity unit or some other stuff that can fit in there. Lastly, the size of your bathroom – whether a new one or a renovated one – will have a tremendous effect on your budget. The size of your bathroom will also affect the type or size of the materials or fixtures that you will put in it. For example, you can have a very large bathtub and vanity sets if you are planning for an equally big bathroom. In the same manner that only small paraphernalia or fixtures will need to be installed in an average or small-sized basement bathroom. The second factor to consider is your intended design. Homebuilding magazines and/or browsing through the internet – which will help you achieve the theme that you want for your bathroom. Are you the vintage or rustic type or you more inclined to have a modern look for your bathroom? Or would you rather choose the more conventional look of your bathroom? Discuss with your family and contractor – Each of your family members will surely have something to say. In the same manner that surely, your contractor will be able to discuss and give you suggestions as to the most suited design for yourself and that will also fit the overall look or theme of your house. The last, but definitely not the least, factor to consider is your budget. This is strongly linked to the first two factors stated above because the size and your design will not be achieved if your budget will not be enough. In considering your budget, it will be helpful to check the current market trend in home and/or bathroom renovation. It will also be helpful if you do the canvassing of materials that you want to put in your bathroom. For example, the tiles, the sink, the shower set, their prices can be easily checked when you and roam around home service depots, etc. your contractor will also be able to give you a concise idea of how much each item will cost. The success of your basement bathroom renovation will be successful if you can effectively consider the three factors skilfully specified above. Basement Bathroom Renovation IdeasThere are a number of unique and artistic basement bathroom ideas. Let’s name some of them:Earth-friendly theme. Eco or earth friendly theme for your basement bathroom can be achieved in several ways. Once of which is by the use of recycled materials for your bathroom design. For example, an old and painted tire which can be converted as a sink, with the help of some expert plumbers. Or your old mirror can be redesigned or framed and will give a brand new look for your basement bathroom. Vintage theme bathroom is for elegance. You can have items like a vintage looking bathtub, stone floors, brass holders, brass door knob, vintage vanity set and the likes. Vintage theme is very in. and since this will be for your basement, having a vintage themed bathroom will surely generate lots of gasps and admiration from your friends and families. The modern themed bathroom can be achieved in several ways. One is the play of colors. You can have black as your color motif to achieve modern themed basement bathroom. A black bathtub or black vanity cabinets would do. Some preferred. A combination of red and white for your tiles, some red highlights in the cabinets and/or drawers will surely give that red and bright effect to your modern themed bathroom. 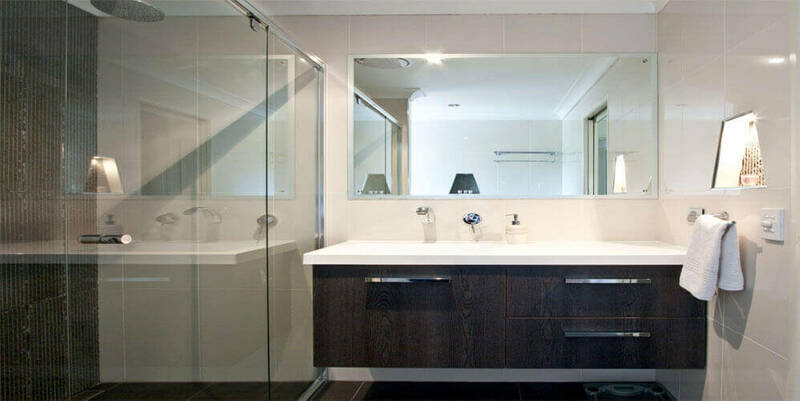 Another approach to achieving modern theme is by the use of modern and state of the art items inside the bathroom. Irregularly shaped sinks, specialized toilet with bidet, a Jacuzzi and bathtub in one. These are just some of items you can buy and put inside your basement bathroom to achieve that modern look that you want. They are sometimes the most expensive, but if budget is not an issue, then you should not limit yourself and your imagination. Believe it or not, just by having a very big or spacious bathroom will already help you that modern theme for a bathroom. Just the presence of vanity set, a bathtub, and a big wide space will give you a modernized basement bathroom. Family Pictures and memorabilia. Putting your family’s old favorite toys, gadgets and/items, displaying lots and lots of pictures – individually or as a mommy or as a group, Family, you know. Putting lots of family pictures and memorabilia can also be helped in orders vintage or rustic theme. He says she says theme. There are many houses right now that would like to give equal consideration to both the male and the female users. This is normally done by putting or using toilet bowls for both the males and females. It is very pleasing to the eyes if a flowery basement bathroom will be set up. More girly-girly daughters find it so cute to have flowery pictures as your primary choice of basement bathroom designs. Use of light pink as the major color will also help achieve that girly theme. Shower knobs and faucets with a billiard ball attached to it. Pictures or the names of the athletes you really admire can be posted in frames inside the bathroom. Walls painted with a number of known sports like basketball, swimming, golf, etc. these are just some of the suggestions to help you achieve that sporty theme of the basement bathroom. Going conventional. This is still among the most favorite basement bathroom theme. Old style toilet, usual vanity sink, and cabinets, a shower – these are the usual. It may be a conventional choice but still, the most favorite, trusted and/or tested basement bathroom theme. These different basement bathroom themes may also be done in the other toilet or bathroom inside your house. The key here is the fact that it should reflect you and your entire family’s personality. It is for you and for your friends’ use, so make sure that you will have that enjoyable and pleasurable feeling each time you will use the bathroom. And this will only happen if you are happy and more than content with the basement bathroom design that you have planned and the contractors’ have executed. The technical side of basement bathroom renovation. The technical side of basement bathroom renovation is normally from the contractors’ or architect’s point of view. This may include plumbing, environmental or governmental permits that you need to secure, the number of tiles, the reliability of tools and equipment to be used etc. These are just of the items that you have to see and check when having a basement bathroom renovation. Surely, these are items and concerns that are answerable and responsibility of most contractors. But because you will be the one paying for it, you should, of course, know what and how much it is. Not only will it financially benefit you if you are to ask, budget or check the technical needs of our basement bathroom renovation project. Knowing such details will give deeper understanding and knowledge of what contractors really do, how do they solve most usual complex money problems of potential customers and the like. For the plumbing, for example, you as the house owner should know exactly how the sewerage system will be affected. Are you going or will you be forced to provide a monthly contribution for the town because of an additional bathroom? Will you be needing building consent or environmental concern for the planned renovation? For construction proper, how many builders will need to be contacted? Have you considered the season when the renovation will take place? It is because most constructions, may it be for a whole house or just for a bathroom, is done during summer. It will be hard or it will take more days if it will take place during rainy seasons because the weather will definitely affect the builders’ schedules. Indeed there are really more items you will have to look at regarding your new or redesigned basement bathroom. Almost, if not all of the items that will be included in the technical aspect of basement bathroom renovation will have to be done and will always have money involved. There are two common denominators with all the matters that have been discussed above. This is money and personality. Your personality will greatly reflect towards the result of your basement bathroom project. This will show how you are as a person, what your likes are and what matters to you individually and as a family. On the other hand, money factor is and sometimes the strongest deciding factor to the type of basement bathroom that will be done. If there’s no limit in the budget, then contractors will be very happy to install and follow all of your wishes for a basement bathroom. But if there are some financial limitations, then the contractors can only suggest and advice as to what can be bought, what can be made and what can be installed to finish the basement bathroom that you have been aspiring for.